I love this time of year, with its burnt orange and brown hues, and pumpkins and witches adorning shops and houses in readiness for Hallowe’en. I have always loved decorating the house and doing a special meal, which goes back to Hallowe’en teas my Mum made when my brother and I were little. 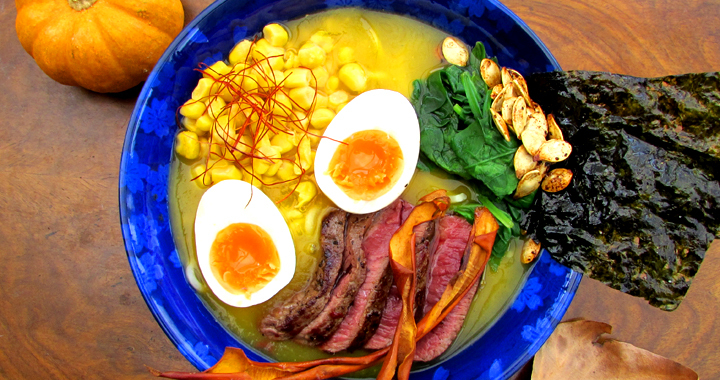 Last year I made a garlic infused ramen to ward off evil vampires (see my recipe here). 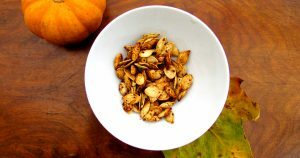 This year I thought I would use one food item that makes everyone think of Hallowe’en: the pumpkin. This stunning bright orange fruit is tasty, nutritious and creates food that is a gorgeous Autumnal colour, yet often it is thought of as nothing more than a lantern to carve and pop a tealight in. This year I have made the pumpkin the headline in both my ramen broth and toppings, to create a spiced warming ramen that will give you warmth on these cooler Autumn days and help ward off any evil spirits on Hallowe’en. Note: I have used Waitrose 1 cherrywood smoked venison steaks, but you can substitute normal venison or fillet steak if you prefer. To accompany: Seeing as this is a pumpkin filled Hallowe’en ramen, it made sense to match it with a Hallowe’en themed tea. I recently discovered the spiced pumpkin pie tea from Bluebird Tea Co, a Brighton based company (so local to me!). The tea is a chai blend, so more Indian in theme than oriental, but with its delicately warming spice, it worked well with this dish. It also tastes great without milk! Preheat the oven to 180°c. Place the unpeeled onion, shallots, garlic and ginger on a baking tray. Cook in the oven for 15 minutes, then remove and peel them. Chop the pumpkin into 2” cubes and place in a saucepan of boiling water. Bring back to the boil and reduce heat to a simmer. Cook for 20-25 minutes, until the pumpkin is soft- check with a knife. Drain the pumpkin and use a stick blender to smooth it down to a puree, ensuring there are no lumps. Heat a wok on a high heat and add the whole spices and dry fry for a minute, making sure they don’t burn otherwise they will taste bitter. Take the wok off the heat and add the stock, onion and ginger. Bring to the boil and turn the heat down, allowing the stock to simmer for 30 minutes for the flavours to infuse. Using a sieve, Chinese spider or slotted spoon, remove the onion, ginger and spices from the broth, making sure all bits are removed. Chop the red chilli finely and chop the peeled roasted shallots and garlic. Add these with the pumpkin puree and coconut milk to the broth. Stir well to mix. Add the rice vinegar, soy sauce, mirin and turmeric, stir to combine and taste to check for seasoning. If too sweet add a little more soy sauce. Keep warm while you prepare everything else. Heat the sweetcorn and blanch the spinach, then drain both and keep warm. Heat a frying pan with 2 tsp. groundnut oil on a high heat. Add the venison and cook to your liking. The Waitrose smoked venison is very lean so I simply seared it well on all sides, leaving it pink in the middle. Remove from the heat and allow to cool slightly before slicing into fine strips. Heat the noodles as per pack instructions. The Biona spelt noodles take 5 minutes from boiling for the perfect texture. Drain and divide between two bowls. Ladle over the pumpkin broth and arrange the toppings over the broth. If you are using the pumpkin crisps and seeds, place them on top of the sweetcorn and spinach to stop them from going soggy. Sprinkle with angel hair chilli strands. Preheat the oven to 180°c. 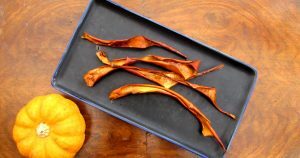 Sprinkle the pumpkin skin strips with a little salt in a bowl and allow to sit for ten minutes. Drain the water the pumpkin strips have sweated out and pat dry with kitchen towel. Place on a baking tray and sprinkle with oil, salt and pepper. Cook in the oven for approx.. 10 minutes until golden orange/brown. Keep an eye on them as they burn very easily. As they cook they will curl up. Serve on top of your ramen. Preheat the oven to 180°c. Remove any of the stringy flesh from the pumpkin seeds and wash the seeds well in a colander. Pat them dry on a piece of kitchen towel. Mix together the soy sauces, wasabi powder and salt and pepper in a small bowl. Spread the seeds out on a baking tray, sprinkle with the oil and the seasoning mix and use a spoon to coat all of the seeds. Cook in the oven for about ten minutes, until nicely browned and crispy. You need to keep an eye on them as they burn easily! Serve as a snack or a topping for a steaming bowl of ramen. Posted in Ramen Dishes, Recipes and tagged Halloween, Pumpkin, Ramen, Venison.